Motichoor Ladoo, another sweet that I had wanted to try for a long time, but kept putting it off until now. 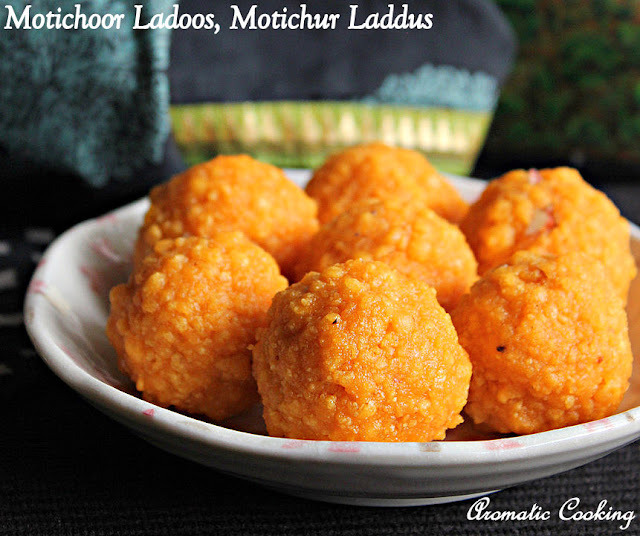 The main difference between Motichoor Ladoo and the Boondi Ladoo, is the size of the boondis ( fried gram flour balls ), it is very small in size in Motichur Ladoos. Also, we add cardamom and rose essence for flavor in Motichoor Ladoos, whereas in Boondi Ladoo, we add cardamom, cloves and edible camphor for flavor, and also Motichoor Ladoos are softer than Boondi Ladoos. There is a special ladle, Boondi Karandi ( karandi meaning ladle) for making the boondis for the ladoos, and in that also we have differnt ones for making the different sizes of boondis. I had with me, only the regular Boondi Karandi, not the one for making tiny boondis, but we can still make them, they may not be 100% perfect but we can still get close enough results and taste wise there will not be any difference. Even if you don't have a Boondi Karandi, you can still make it using the regular Jali Karandi ( the one with small holes) that we have in our kitchen for deep frying, so do try out this delicious and traditional sweet for this Diwali..
Sieve the besan flour, add the semolina and salt to it, then add water to make a thin pancake batter or dosa batter. 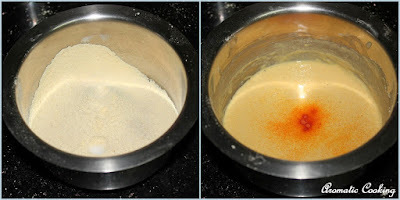 The batter should be smooth without any lumps, then add the orange food color and mix. I have shown the arrangement for making the boondis ( saw it on many youtube videos ), place a tin, the height should be a little more than the pan in which we will be frying the boondis. Place a towel on top of it and keep the boondi ladle on top of it, as shown in the picture. Now heat some oil, once it's hot enough ( drop of batter added to the oil should rise up immediately ), reduce the heat to medium, add a ladle of batter to the boondi ladle ( spread and pour all over ), then start tapping the boondi ladle fast over the towel on the box, the batter will fall in small droplets into the oil. 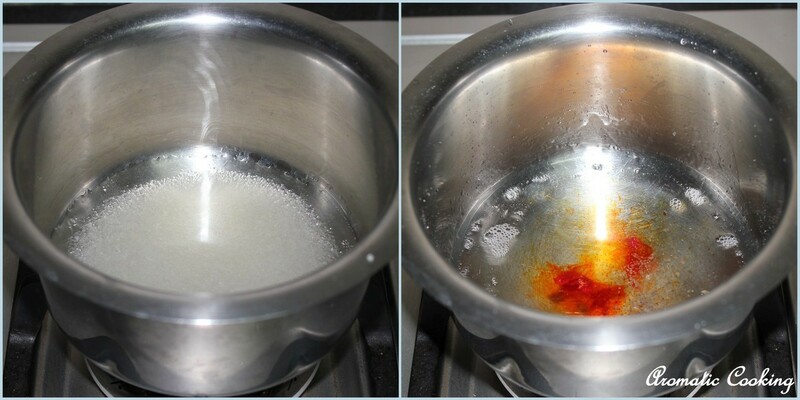 Leave the dropped batter (boondis) to cook for about 30 to 45 secs, remove them and drain the excess oil. 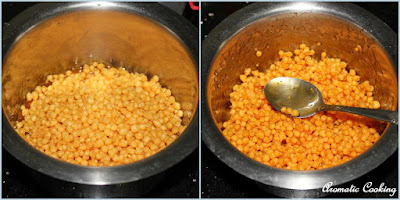 Wipe the boondi ladle with a wet cloth each time, then repeat, till all the batter is over and the boondis are done. Take the sugar and 3 tablespoons of water, heat and mix till the sugar dissolves, then keep heating without stirring much, until it reaches the 1 string consistency ( a drop of sugar syrup between the tips of the thumb and fore finger should form a string when we open the tips of the fingers ). Switch off, then add the lemon juice, a bit of the orange color and the cardamom ( powder the inner pods and add), rose essence, mix and keep. Now add the boondis to the sugar syrup and mix, the boondis will absorb the syrup, let this cool and dry a bit. Then add the boondis a little at a time to a food processor and blend till the boondis break down a little. To this boondi, add the almonds and a tablespoon of very hot water, mix with your hand and make small lemon sized balls/ladoos and enjoy. If you don't have boondi ladle, use the regular ladle with small holes instead. If you get really tiny boondis, then we can skip blending in the food processor and directly make the ladoos, when the boondi mixture is cool enough to handle. 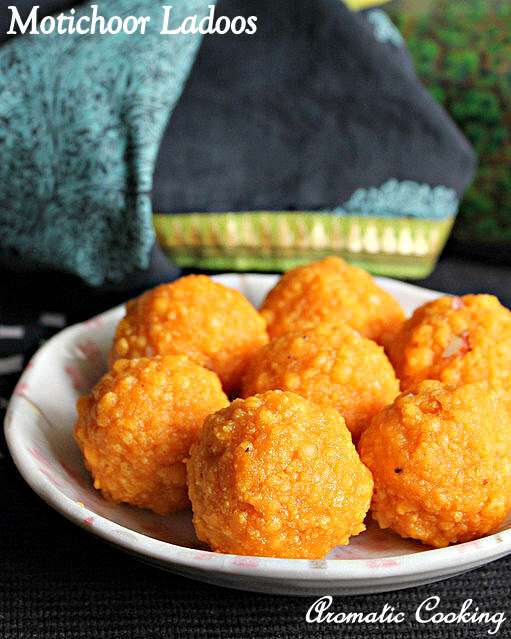 These ladoos stay good at room temperature for a day, after that, it's better to refrigerate, but bring it back to room temperature before serving. If you don't have a food processor, you can use a regular blender, just pulse a few times, but the texture from the food processor is better. 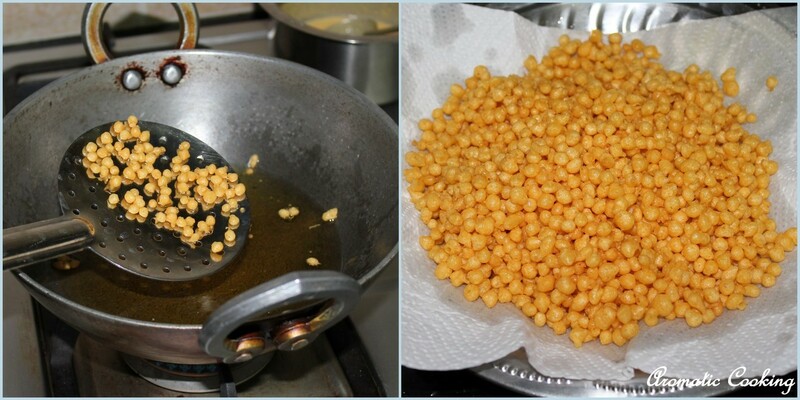 I have used oil for frying the boondis, you can use ghee or a mixture of oil and ghee, ghee gives a nice flavor. These are one of my favorite laddoos, delicious!